Fundamentally cryptocurrencies are bearer instruments (BI). A BI is a document that entitles the holder of the document – or the equivalent digital version – rights of ownership or title to the underlying property, such as shares or bonds. Bearer instruments differ from normal registered instruments, in that no record is kept of who owns the underlying property, or of the transactions involving transfer of ownership. Whoever physically holds the bearer document is assumed to be the owner of the property. This is useful for investors and corporate officers who wish to retain anonymity, but ownership or legal entitlement is extremely difficult to establish in event of loss or theft. However, this function is very inconvenient to US tax authorities and either not understood or ignored by the authors of “IRS Virtual Currency Guidance : Virtual Currency Is Treated as Property for U.S. Federal Tax Purposes; General Rules for Property Transactions Apply“. Among other impossibilities the notice provides that virtual currency is to be treated as property for U.S. federal tax purposes this means that wages paid to employees using virtual currency are taxable to the employee, must be reported by an employer on a Form W-2, and are subject to federal income tax withholding and payroll taxes. Blockchain is by far the most important paradigm many people – even those who own cryptocurrencies – do not yet understand – and it might even be the true realization of what the Internet promised to be. Blockchain-based solutions are building a future which will be more decentralized and democratic, whose beneficiaries will range widely from economic refugees to investment banks. The World Economic Forum estimates that within 10 years more than 10% of global GDP will be stored on blockchain technology. Rapidly evolving blockchain startups are likely to fundamentally change entire business models, fundraising models, business operations, payments systems, and more. Despite the importance of this emerging paradigm, much confusion surrounds the topic. A blockchain is a decentralized, distributed digital ledger used to record transactions across many computers so that the record cannot be altered retroactively without the alteration of all subsequent blocks and the collusion of the network. Bitcoin launched in 2009 as a peer-to-peer (P2P) digital payment system and was the first-ever introduction of a blockchain (even though the word ‘blockchain’ is not mentioned in the original Bitcoin whitepaper). Its creator or creators derived a system, using computer networks, cryptography, and game theory – now collectively referred to as “crypto economics” – for parties around the world who do not know each other, to conduct and record transactions without an intermediary. By circumventing intermediaries, users can send value across borders using the Bitcoin blockchain. Blockchain’s game theory component is essential to the architecture of the public blockchain: It establishes incentives and disincentives based on pure economic rationality and self-interest for participants to validate transactions in the network and to play by the rules set forth by it. It underlies the self-regulating mechanisms in decentralized networks and applications. Game theory also informs the robustness of the network to malicious activity from harmful or adversarial actors within its system. This robustness is usually described in terms of “Byzantine fault tolerance” (BFT) or “fault tolerance” and is based on the Byzantine General’s Problem that states that no more than 33% of the network participants can be malevolent to maintain the system’s integrity (in practice, the Bitcoin blockchain’s threshold for fault tolerance is 50.1%). The result is that, entirely from the bottom-up and with no centralized coordinator or guarantor, the P2P network runs smoothly and honestly in a “trustless” environment where participants are self-interested and do not know one another. In fact, during the week ending June 21, 2017, 1.8 million transactions were sent over the Bitcoin network without interruption, constituting $4.4 billion of value (at a $2507 bitcoin price). In the years after 2009, several less anonymous, but ingenious engineers have developed alternative blockchain technologies that modify and enhance the original Bitcoin system. The most noteworthy example is Ethereum, which is the second-largest system by market capitalization. Cryptocurrencies are the “native” digital currencies that exist in blockchain systems or applications. 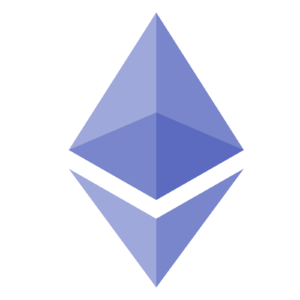 Whereas the Bitcoin system’s native cryptocurrency is bitcoin, Ethereum’s is called ether. All blockchains use their own native cryptocurrencies (“ALT COINS”) or require the use of major ones such as bitcoin and ether. There are about 781 cryptocurrencies in circulation as of August 15, 2017. Cryptocurrencies are necessary to operate blockchain systems because they are the incentive mechanism for computers (“nodes”) in the network to conduct (“validate” or “verify”) transactions. There can be little doubt that cryptocurrencies will replace fiat currencies over time (similar to VoIP replacing copper lines). This trend will first occur where the money supply is already artificially high (this includes the United States) without having proper backing. Smart contracts are computer protocols intended to facilitate, verify, or enforce the negotiation or performance of a contract. Smart contracts were first proposed by Nick Szabo in 1996. Smart contracts may contain many kinds of contractual clauses which are made partially or fully self-executing, self-enforcing, or both. The objective of smart contracts is to provide security that is superior to traditional contract law and to reduce other transaction costs associated with contracting. 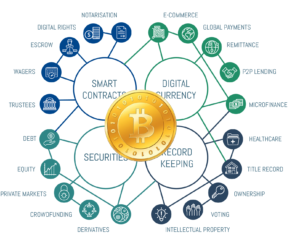 Smart contracts have been used primarily in association with cryptocurrencies. The most prominent smart contract implementation is the Ethereum blockchain platform, which also refers to them as decentralized applications or simply “Dapps“. All blockchains or similar “distributed ledger technologies” (DLT), have a common set of characteristics. This is how they work: Blockchains are digital ledgers or logs that record electronic transactions that occur between two parties. The two parties do not know each other and directly engage in a peer-to-peer network of connected computers. Rather than relying on a third-party middleman such as a bank, Stripe, PayPal etc. the network collectively reaches an agreement (“consensus”) on which transactions are legitimately using a consensus mechanism. By “legitimate,” we mean that, for example, John sends money to Jane and does not spend the same digital currency twice (called a “double spend”) or do anything else malicious. There are several types of consensus mechanisms, each with pros and cons. The main types are “proof-of-work” (examples are: Bitcoin), “proof-of-stake” (the basis for Ethereum), and “proof-of-authority” (the basis for private chain setups). Proof-of-work is very wasteful of electricity, which is one reason people want to adopt other mechanisms. Once the network approves the transactions, the transactions get posted to the digital log. In Bitcoin, attempted transactions are first grouped together in a block, which then gets verified all at once (by the proof-of-work mechanism) and added to a long chain of blocks. This is why it’s called “blockchain”. The blocks are linked together using cryptography so that you cannot surreptitiously edit or tamper with the transaction data on a block once a subsequent block is added to the chain after it). The transaction details are transparent and verifiable by the public. However, the identities of the buyers and sellers are hidden behind their public usernames, which are long alphanumeric addresses. Here’s a window into the Bitcoin blockchain. The simultaneous transparency of transactions and masking of identities is why blockchains can be used to both anonymously buy drugs and obediently report to regulators. Some blockchains can restrict transaction visibility and participation to designated parties; these are called “permissioned” or private blockchains. Many large companies are very interested in these private blockchains, because they do not want proprietary or competitive data to be public. The R3 Consortium of most major banks in the world (which raised $107 million in funding in May) has developed a private blockchain system called Corda that just entered beta phase and so has the Linux Foundation with support from IBM with the Hyperledger Fabric. Another innovation is Zcash, which allows you to hide details of transactions such as the sender, receiver, and amounts (using zk-SNARKs) while operating on a public blockchain. JPMorgan recently announced a partnership with Zcash. Using cryptography, transaction information is recorded in a way that is permanent and tamper-evident. As a result, we can call the blockchain “immutable.” System attacks are almost impossible, except potentially by quantum computers in the future or in a concerted attack by a majority of participants in the network (there are different types of attacks requiring different levels of participation to succeed). Some DLTs such as IOTA are developing quantum-resistance. The blockchain record is downloaded on thousands of computers around the world that are participating in the network. These computers constantly sync, or update, the record for new transactions. As a result of this wide data distribution, there is no single site of failure that attackers can target. In other words, to delete the blockchain you would need to destroy the thousands of computers in the system all around the world. In summary, data are not stored in concentrated sites, but rather on a log that is downloaded on thousands of nodes and constantly syncing. New data locks onto the log using cryptographic hash pointers referring to preceding and subsequent transactions on the ever-growing “chain” of transactions. Blockchain technology and cryptocurrencies together can be referred to as “crypto economics” not as a subset of economics, but rather an area of cryptography which that takes game theory/economic incentives and economic theory into account. Bitcoin, LiteCoin, Ethereum, Zcash, and all other public blockchains are visible products of crypto economics.